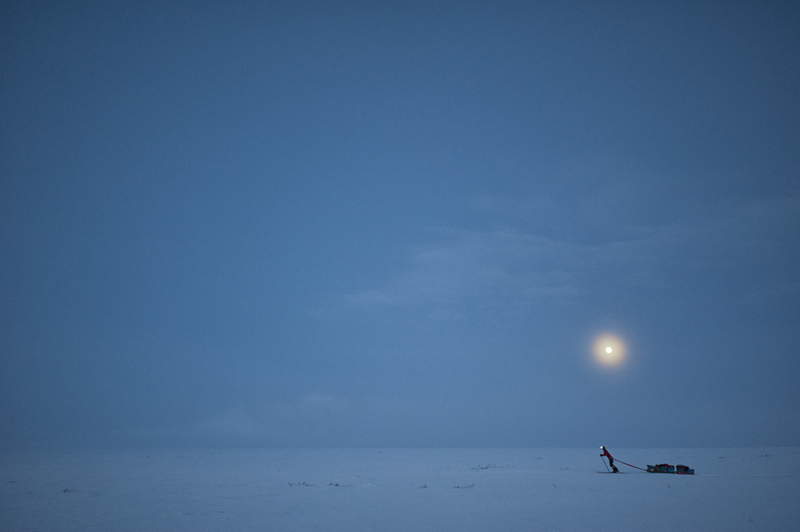 When tackling your first expedition in freezing conditions, the last thing you want is a series of unexpected setbacks. Unfortunately for Peter Mather, this is exactly what happened on his expedition to photograph the caribou in the Crow Flats in North Western Canada. It did however provide him and his partner Marty with an incredible adventure story. Peter spoke to us about his story 'In Pursuit' and how some unexpected challenges resulted in an adventure he and his partner will never forget. You were expecting to be dropped off by the plane at Margaret Lake so you could simply wait to photograph the herd of Porcupine caribou migrating. What went wrong? The pilot couldn’t get us to our intended location because there was something wrong with the plane. In the end we were dropped off on one of the small lakes that make up Crow Flats, pretty far from Margaret Lake. It meant that we had to complete a 120km cross country ski trip in order to get to our intended location and we were under time pressure to get there before the caribou so we could set up for the shot. If we had prepared for a big cross-country ski trip and had less equipment it wouldn’t have been too bad. As it was, we were poorly prepared for such a tough expedition. What caused you to be interested in doing this expedition? Was it worth the effort you put into it? 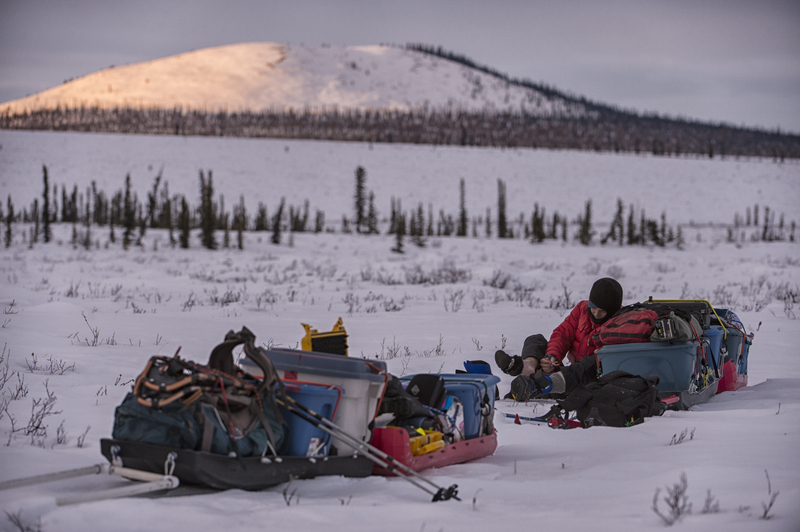 We went out there to photograph the Porcupine caribou. They have the longest mammal migration on the planet and we were seeking an intimate image of their migration that captures the scale of the herd and the teamwork they employ in winter. They are important to us because they are currently being threatened by industrial development in the area. In the end though we weren’t able to capture the photo we were seeking. What we did get from the expedition though was an incredible adventure which was worth everything we put into it. Every time Marty and I meet up at the pub we relive the adventure as it’s had a huge impact on both of our lives. I have fond memories of the expedition. Skiing side by side with Marty made me feel a kinship to the Gwich’in First Nations people who travelled the same route centuries before us. Planning an expedition to such a remote area must have been difficult. How did you go about planning for this expedition? The planning was even harder than the expedition. My previous longest ski trip was a single night, whilst Marty didn’t have any winter experience at all. 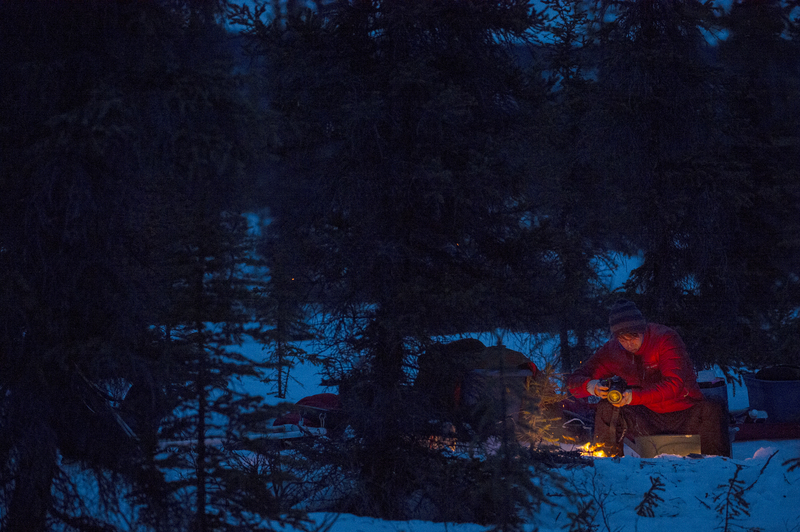 Luckily, one of my friends - Peter Heebink - is a ski trip expeditioner in the Yukon. He has been doing trips like this for 40 years. I spoke to him about the expedition many times and the advice he gave us proved to be so crucial because of all the problems we had along the way. We could never have done this without his knowledge. He advised us on things we would never have known, like to use a high-quality winter sleeping bag and a sleeping mat rather than a tent, as tents fill with condensation in winter and are a massive hassle without being very effective. Sleeping outside, the snow didn’t even melt on our sleeping bags because they were so efficient – we were comfortable at plus 20 in the sleeping bags despite it being minus 10 outside. The technical trouble that resulted in you having to tackle a 120km ski trip must’ve been difficult to cope with. On top of this though, you had big problems with injuries and changing weather conditions. Did you expect difficulties of that scale? Have you faced problems like these before? After knowing we had to travel cross country for over 100km with 700lbs of equipment, we knew it was going to be hard work both physically and mentally, so the pain and injuries were expected. Nevertheless, they were difficult to cope with. Previously, we had only ever been pushed to our limits in small doses through sports and small expeditions. This expedition was the most intense physical and emotional journey either of us will ever experience. In order to ski as fast as possible, you decided to ski overnight to take advantage of the hard snow. Were there any safety concerns, skiing overnight? Would it have been easy to be rescued if something had gone wrong? We didn’t have any concerns with skiing at night. So far north and heading into spring, it never got totally dark because the days were so long. The sky would simply get a dark blue for a few hours. Plus, our night-time skiing schedule was far more effective, so we had to stick it. As for any possible rescue, we would’ve been able to get a helicopter to our location within a day if something went wrong with an accident or a bear attack. Thankfully, that didn’t happen. Having encountered a grizzly bear before it is not something I want to go through again. Your journey to the caribou was evidently not an easy one. What did you find hardest to cope with, when it seemed like everything was going wrong? Physically, the skiing was exhausting. It took every ounce of energy we had to keep going. When every muscle in your body aches - it is hard. But we had to keep going and not give up. The times I found the hardest were when I’d been leading the way for hours, praying the snow underneath me wouldn’t break. If you sink into the snow you have to push even harder to dig out of the hole the ski makes. Fortunately, Marty and I are a good team. Whenever I got to breaking point Marty could always tell and would offer to take over as lead, as I would with him. Although this was your first winter expedition, you have done many expeditions before. What motivates you to go on these expeditions? Well, it is easy to get motivated because I love adventure. What is really hard is being away from the family for so long. On this trip, while I was gone, my oldest daughter had a serious health scare. That was really tough, and it was touch and go about whether we would pull the plug and get picked up by a helicopter. A but I guess a sense of adventure, memories of the environment and great stories are the bits that I love to take back with me. They are powerful motivating factors. You must miss the sense of adventure and the wild environment. Are you planning on venturing back out on another expedition? Although Marty and I made a pact to always look back on this expedition with fondness and good memories, we did also make a pact to remember the hell that the expedition was, to ensure we never try something so stupid again. But, the pact hasn’t lasted long as we’ve already returned to the crow flats and we’re planning to return again! The lure of the perfect photograph, the wild environment and the sense of adventure is all just too much to resist. To find out more about Peter’s story click here.